Are you designing a bathroom? Be inspired by this nature-inspired space in a family home, one of our favourite real home transformations. With both a career in project management and as a freelance interior designer, it’s no surprise that Anna jumped at the chance to manage, plan and design her own bathroom transformation. After living in London, Anna, her partner, Matt, and their daughter, Mia, moved into this semi-detached house in Cheltenham in 2013. They were attracted to the property because of the large rooms and community feel of the neighbourhood, but also because of the opportunity to put their own stamp on the place. The family bathroom was already a good size, but needed modernising. ‘I wanted to make it more visually interesting – relaxed but luxurious, and suitable for the whole family,’ adds Anna. She began by playing around with layouts to get the most out of the space, but soon realised the existing layout was the best, meaning little plumbing work was needed. Storage was another key factor in her design, so Anna added a stud partition along the entire length of one wall, which houses a large recessed mirrored cabinet, plus shelving over the bath and sink. Despite making the room technically smaller, it means that both clutter and pipes can be hidden away. It also allows the basin, WC and taps to be wall-hung, giving the illusion of more space, with a clean, minimalist look. 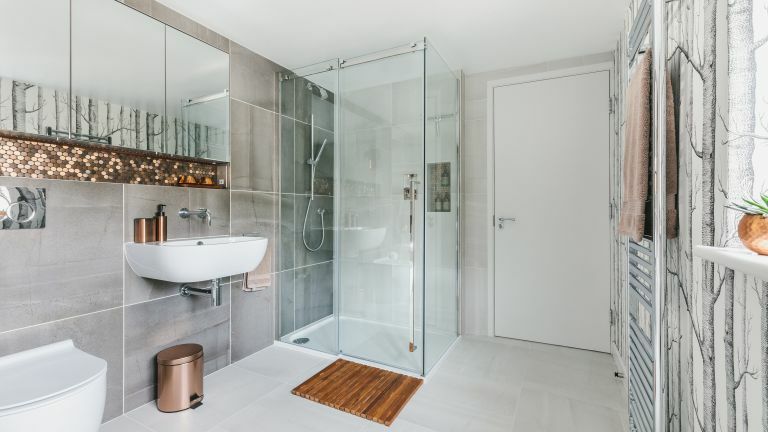 Anna hired bathroom fitter, Americo Sousa, who was recommended to her by one of the local companies that supplied her bathroom fittings, and the project took just three weeks in total. Her friendly neighbours were a life-saver during this time as they allowed the family to pop next door for a shower. ‘It was also very handy that we have a downstairs toilet,’ she recalls. As a stickler for detail, Anna’s biggest concern was that the large-format tiles she chose wouldn’t quite align with the mirrored storage cabinet, as they had to be millimetre-perfect to line up. Despite sleepless nights and lots of measuring and re-measuring, when delivered, the alignment was just a couple of millimetres out. Her bathroom fitter managed to make it work by adjusting the hinges on the cabinet doors to get them to line up. ‘It wasn’t a major issue in hindsight, but it’s important to get small details resolved to achieve a great finish,’ says Anna. With her passion for design, Anna wanted a nature-inspired scheme. She chose to create a feature wall around the window by hanging striking Woods wallpaper from Cole & Son. ‘I adore this design and it fits in perfectly with the grey tiles,’ Anna says. ‘Even though it’s not specifically designed for bathroom use, it wasn’t going to be in direct contact with water, so I simply sealed it with Polyvine decorators’ varnish for extra protection.’ Large-format slate-effect tiles were chosen for the walls and floors to make the space feel larger. ‘I love the combination of light and dark greys, but I knew the cool tones would make it seem quite cold, so I added touches of copper to give it the warmth it desperately needed,’ says Anna. She spotted the shimmery brushed-copper mosaic tiles a year before starting her project but, as they weren’t suitable for bathrooms, she searched high and low for something similar. ‘Other copper tiles were polished, and that would’ve been too garish,’ she adds. A perfectionist at heart, she went back to the original tiles she’d fallen in love with, found an industrial sealant used for boats, and coated the tiles with that to protect them against splashes. The copper tone has then been picked up in accessories throughout the bathroom, adding just enough metallic shine for a warm, luxurious feel. The copper is further accentuated by LED lighting in the new recesses, creating a calming ambience for unwinding in the evening. ‘We use the recessed lighting in the middle of the night, as it’s not too bright,’ adds Anna. She also chose overhead LED spotlights, which are on a dimmer, for more practical tasks. Now the space is finished, Anna is thrilled with the final result, and is so glad she made every effort to get exactly what she wanted. If her budget allowed for it, she would’ve boxed in the end of the bath and put recessed shelves above it, but instead compromised with a wall-mounted cupboard.